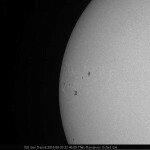 International Space Station – Sun transit. 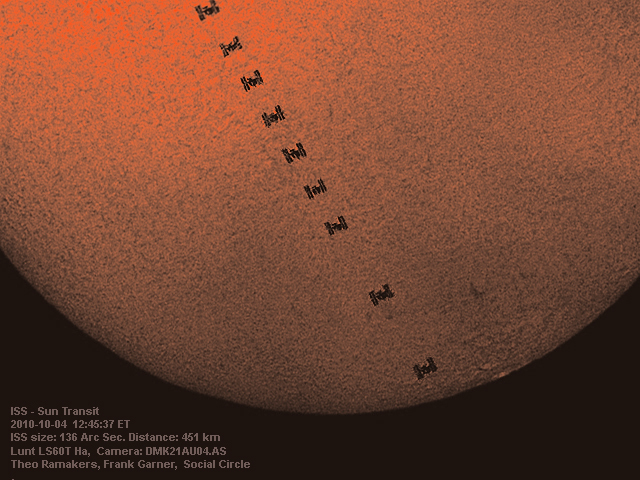 Tonight at 18:45:09 the ISS did transit the Sun. The Center line was about 2 miles from my house, and because of the marginal seeing conditions and the cloud coverage I decided to give it a shot from my normal observing location. Since I made my first full disk white light image this morning, I decided to give that another try. With the ISS being 31″ arc seconds in diameter at a distance of 884 km, I figured I should be able to make out the shape of the ISS at this magnification. I got tired of waiting for Solar or Lunar transits of the ISS, so I tried a direct image again like I used to do in 2008-2010. This was the first time without an Alt/Az mount with the C11 on the EQ6. A lot more challenging, but I managed to get a half decent frame. The pass was on the west side of my location, so the main solar panels stayed in the shadow. Never the less I am happy with the result. The cloudy skies gave way and provided the opportunity to image the ISS again. We chose a location off RT11 a few miles south of Charlie Elliott at the intersection with Henderson Mills Rd. This time we used the SolarMax40 and mounted the camera perpendicular to the vertical axis to get an image that would let us beter understand the information provided in Clasky’s forecasts. Here the image made again by the Frank and Theo Team. We had the opportunity again to image an ISS-Sun transit last Saturday. Marie Lott, Frank Garner and I met in Mansfield to image the event. After a “pep-talk” Marie decided to setup her scope and she was rewarded with her first ISS-Sun Transit image. I gave the DMK31 a try after I was able to recess the mount ring by about 2mm and the camera seemed to come in focus. However, it turned out that my PC was acting up with producing irregular transfers from the camera to the PC, resulting in only 5 frames with the ISS. The beauty of AR1121 however made up for this hickup. Imaging Jupiter has been a challenge for me lately. The seeing has been really bad so I have not taken much time to process the data I captured. I might get back to that in a while when things slow down. In the meantime I’ve been busy with outreach programs and keeping track of ISS transits. Today we had a Sun transit at 12:45 P.M. Frank and I went out to capture this and Art Zorka from Atlanta came out to see how we do this. The forecast was for 31% cloud coverage, so we were prepared to miss the event. However, the sky was clear during most of the setup, but shortly before the pass a cloud moved in…… and out. Two minutes before the pass, I ran a test run on my camera and believe I captured another satelite transit the sun. Than the cloud moved in and out and on the way out the transit happened. The image shows partly clouds covering the sun while the ISS came through. It has been coming a long time. An image of the ISS transitting our Sun. The last attempt this past Monday failed because of last minute confusion about the time. Today Frank Garner and I set out to capture this afternoon’s Sun transit of the ISS on its 67033 orbit since its launch on November 20, 1998. The distance to the ISS was 405 kilometers. The angular size of the satellite was 47.2″, which makes it 1/40th of the diameter of the Sun. The ISS came close to Sunspot AR1092 and some nice solare proms are visible also. We almost missed this pass as an object passed accross the field of view about 20 seconds prior to the ISS, which we first thought was an early pass. We stuck to our imaging plan and caught the right pass on time. It also appears that the transfer between the camera and my laptop was quite busy, since it skipped a few images in the sequence.